economically progress the more it grows. Economic progress is measured in terms of its Gross Domestic Product. GDP is calculated in terms of the monetary value of all legal transactions involved in the primary, secondary and tertiary sectors of economy. More the goods and services are produced and consumed, more the GDP rises and more the country progresses. Most countries in the world and international financial institutions use GDP as a yardstick to measure progress. So much so that some modern economic experts are obsessed with merely maintaining high rates of GDP. Fall in GDP rates brings gloom to economies. However, from time to time questions have been raised about the GDP being a true measure of progress. Does it capture the overall growth in a holistic sense? Does it hide more than it reveals? Does it have some adverse affects? If GDP is not a true reflection of progress, what is? Let us consider some of these questions. GDP doesn’t reveal the actual wealth distribution. It is not uncommon for the GDP of a country to increase simultaneously with increase in gap between the rich and the poor. It implies that the wealth being generated is concentrated in the hands of a minority rich section of society rather than being equitably distributed. Economic inequality does not lead to a healthy society as it results in a plethora of social problems. These include crime, violence, physical and mental illness, unsatisfied aspirations of youth, disintegration of community life, trust deficit within and among families, drug and alcohol abuse, social segregation, more members of marginalized sections of society landing in jail, lower literacy levels and health status of society, homelessness, suicides, to name a few. Thus what we get is an encumbered growth. their own do not contribute to growth but if trees are cut down and wood sold in the market then this activity contributes to GDP. If people are healthy they do not contribute to GDP. But if they fall ill frequently, have to consult doctors, undergo tests and consume medicines they contribute to GDP. If people are hale and hearty they do not contribute to GDP. But if they have to visit psychologists, psychiatrists or counselors, they contribute to GDP. If water sources are clean, they do not contribute to growth, but if they become polluted with industrial waste, chemicals used in agricultural fields and sewerage, their cleaning constitutes an economic activity. The bottled water industry stands to gain directly from polluted water sources. If society is crime free then it doesn’t contribute to GDP. However, if we hire security personnel and buy expensive equipments, arms and ammunition, it contributes to GDP. At global level if there is peace between nations, it doesn’t contribute to GDP. If there are wars and dangerous weapons are used it may boost some economies. There is money to be made even in post war reconstruction work, contracts for which are decided even before the war begins. If people exchange gifts and services as part of barter system, it doesn’t contribute to growth but if the same things and bought and sold, they begin contributing to economy. If people live in joint family system as part of which they share resources then they don’t contribute to GDP. But if there are disputes within family, lawyers have to be hired to contest legal cases, money is spent to divide property and to build boundary walls, nuclear families buy more items from the market, it is good for economy. If the production and consumption is local it is not good for larger economy. But if long distance transportation of goods is involved, packaging and middle men are involved then it contributes significantly to economy. If women take care of domestic chores it doesn’t contribute to economy but if men go out and cook food in a restaurant or a lady baby sits for payment then there is a contribution to GDP. If one helps another human being as a volunteer out of a sense of service, which gives inner satisfaction, it doesn’t contribute to economy. But if the same job is done by a professional, it contributes to GDP. If one believes in the omnipresent notion of God and worships from home it doesn’t contribute to economy. But if one goes on pilgrimage to visit a special place where God resides, it contributes to GDP. If one pays attention to words of wisdom from elders in family and community it doesn’t contribute to GDP, but if one goes to listen to one of the commercial preachers, some of them in the garb of sages, it contributes to economy. 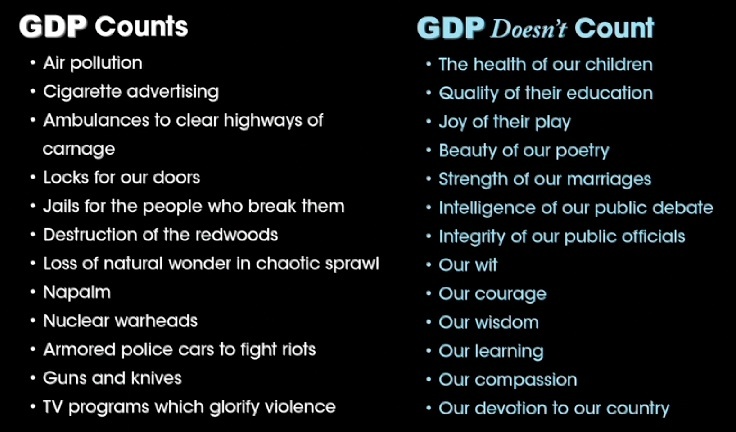 Quite clearly GDP is a very inadequate criterion of growth. It doesn’t capture quality of human relationships, psychological and physical well being of human beings, sustainable relationship with nature, sense of security or even the fulfillment of basic material needs of all human beings. where ‘happiness’ of human beings becomes the key criterion. Some countries like Bhutan are already measuring the progress of their society on the basis of a Gross National Happiness index. I gave this lecture on Education at Theosophical Society, Varanasi. Submitted the lecture in written form, which is published in their journal. I am a Lecturer and a PhD student at IIIT-Hyderabad, currently staying at IIT (BHU). My PhD problem includes psychological and sociological studies. Just a few years ago, I myself did not know that I will be doing higher studies and that also in humanities! I had joined B.Tech program at IIIT-Hyderabad (International Institute of Information Technology, Hyderabad) in 2003, in computer science department. I had not chosen my stream; I had got this stream because I had a good rank in AIEEE (All India Engineering Entrance Examination). I had a notion that those who get good ranks get computer science. I was neither interested nor disinterested in computer science or any other stream as such. For me studies were just a means to get a good job and good livelihood and I believed that getting a good job and good livelihood was all that was needed in the life! I had normal ambitions, which any normal student joining a good technical institution might have, like complete the graduation, get a good job, work in the industry for few years, do MBA, get married, take loans, buy a house and spend rest of the life in repaying the loans! For all these aspirations IIIT-Hyderabad seemed to me a perfect institute, given my rank in AIEEE. I had joined IIIT Hyderabad because the placements and faculty in the institute were/are good, so it was a suitable institute to fetch me Good Job, Good Package and Good Respect. I have been one of the beneficiaries of this system. I got what I desired from my undergraduate college – Good Job, Good Package and Good Respect. After my B.Tech, I worked in IT industry for two years, earned a lot of money, visited abroad, and experienced the entire “Hell of Affluence”, which most of the students who join colleges, desire for. The reason, I called my life of affluence, a hell, is because it lacked on the very basic thing I needed in my life. In fact, it lacked on the very purpose, I needed this affluence. It lacked Happiness. It lacked peace, fulfillment and joy! My life had become 2/7, which means, in a week, I used to enjoy only two days – Saturday and Sunday, because they used to be holidays! I used to feel, I am living to earn money and not earning money to live. “Life” itself was missing in my life. Amazing thing is, this is not only my personal story, but the story of almost every child who is aspiring to be “Successful” in the current system! Frustration kept growing in me, during those two years in which I worked in IT industry. Things have definitely changed for me now in past few years, after I decided to quit IT industry and join PhD, not in Computer Science, but in Humanities. I assume that this change is for better. Since this is not a document to share my personal journey, so I will not dwell further into it, but I thought of sharing a small personal account, not primarily to share my personal journey, but to show the condition of society we are living in, which constructed our pasts, influencing our present and also shaping our future, without our knowledge! Everything in current society is being driven by the Market. Market drives the societies, the economies, the polities, our education systems, our production and health care systems, our relations, our goals and aspirations and even our psychology! We are being used as the Cogs in the entire machine-like system, for the sake of its own development. The major question here is, people are for development of the system or system is for the development of the people? We, as a human race, have gone completely wrong in understanding the true meaning of word “Development”. What is Development in current system? Replace the mud-brick houses with concrete. Replace the extended family compounds with nuclear family apartments. Replace systems of mutual aid with insurance. Replace communally held land with deeded property. Replace culinary knowledge with fast food restaurants. Replace the identity conferred by local stories and relationships with identity derived from brands. Replace walking with automobiles. Replace traditional songs with entertainment products. Replace sustainable subsistence agriculture with commodity export cash crops. Replace experiential land-based learning with school-based curricula. Replace the village healer with a medical clinic. Send all the young people to the cities. Prepare city people to go to Abroad. Replace small scale industries with big industries. Covert everything into Free Market. Open economy of all the countries. Replace Self Employment with More Industrial Jobs. Convert Natural Resources in Products. Let the industry determine the education, production, justice, health care and even the psychology of people. Let the industry govern the government. If we are doing all this, then that is called development, in current system! Today, we see two major problems, with which entire world is struggling – global warming and wars! Rest of the nature i.e. plants, animals, airs, waters and lands have not gives us these problems. These problems are the consequences of unsustainable human activity. Both of these problems are in a way consequence of our current fallacious understanding of the word “Development”. All said so far, begs us strongly, to answer the question, what is then “Development”? I believe, to understand the root of the word “development” and to understand its real meaning, we will need to understand a “human being’s natural desires” and how “development” happens in rest of the nature. Development in rest of the nature is generally referred to as “Evolution”. There is evolution in nature. Evolution is something which is accepted in science as well. The evolution which we see in nature progresses from Material Order to Plant Order to Animal Order and then finally comes the Human Order. This seems like a natural and logical flow of evolution. The question which comes here is, what is the basic difference between Human Beings and rest of the species in nature? or more specifically, what is the difference between human beings and animals? Evolution in human beings happens in relation to Evolution in their Consciousness. Human beings have the capability to reflect over things. The object of reflection may be internal and/or external. Animals do not have neither the capability nor the necessity to reflect over things. The beliefs of animals towards themselves and towards rest of the nature seem hard-wired by the natural laws. On the other hand “Beliefs” of human beings towards themselves and towards rest of the nature, are not hardwired by the laws of nature. Human beings can become “Aware” of their beliefs. They have capability to question and alter their beliefs. Animals do not have the faculty of “Self Awareness” and thus they also do not have the capability to question and alter their beliefs. Human beings have Free Will. Animals do not have free will. Human beings have the capability to “consciously interfere” into their own process of evolution and the evolution process in rest of the nature. This interference may be negative or positive. If this is negative then we see all the problems which are currently manifested in the world. If it is positive, then there is possibility of creating the harmonious world, we desire. Capability to interfere into evolutionary process is also the definition and manifestation of free will in human beings. In case of animals and other orders in nature, the evolution happens by the law of Natural Selection. As per the process of natural selection the evolution in animals and other species in nature, happens by natural laws and they cannot “consciously interfere” in their own or rest of the nature’s process of evolution. As per this, there is no free will in case of animals. Living of an animal is mostly limited to four aspects: hunger, sleep, fear and reproduction. Needs of a human being transcend these four aspects. A human being needs something more than just the satisfaction of food, sleep, reproduction and saving themselves from bodily fears. We need not teach an animal, what to eat, when to eat, how much to eat, when to sleep, when to wake up, how to sleep, when to reproduce, how to reproduce, how much to reproduce, how to do parenting, how to treat other animals of the same breed, how to treat other animals of different breed etc. Animals do not have insecurity of future, they do not carry agonies of past, and they live in present. Animals do not have any religion, they do not have communal wars, and they do not practice spirituality. On the other hand, a human being needs to be taught, what to eat, how to eat, how to sleep, how to behave, how to have a peaceful mind, peaceful relations, peaceful society and peaceful co-existence with rest of the nature! So we see that human beings have several different and higher needs, than animals. What are these higher needs of human beings? Co-existence with rest of the nature. These are the needs in a human being, which when start to get fulfilled, makes a homosapien, a human. These are the higher needs in a human being. These are the needs which when fulfilled, give happiness to an individual, build mutual trust in relationships, secure fearlessness in society and ensure peaceful co-existence with rest of the nature. If we are moving towards fulfillment of these needs, we say that we are developing, otherwise, we say that we are moving away from development, in the real sense of the term. Word “Development” can have no meaning, unless we define, where we wish to go as a whole. Without defining the goal of human beings, human relations and human society, we cannot define whether we are developing or not. The main thing to notice here is, realization of human goal is not possible, without Right Understanding and Right Feelings in Human Beings. This is where Education comes into picture. The purpose of education as I understand, is to build understanding and capability in an individual, to realize and actualize the human goal, as discussed above. All the education has some “hidden purpose” which it tries to fulfill. There is no education without purpose, this is why we first discussed the purpose which we wish to fulfill through education. If we see in history, Britishers in their education system, which they employed in India, had the purpose to build a race of Babus and Clerks, who can fulfill their purposes, and we know what their purpose was. At least we can say that their purpose was not same as what we discussed above. Summarizing what we discussed till now, we can say that the purpose of education is to help an individual realizing and actualizing the goal, which he naturally desires. What a human being naturally desires? We discussed with the help of animal-human comparison, a human being naturally desires – Knowledge, Happiness, Prosperity, Fulfilling Relationships, Fearlessness in Society, Mutually Enriching Co-Existence with Rest of the Nature, and Continuity of All of the these things. On the basis of these natural human desires, we can say that the goal of entire human civilization logically concludes to be something like – “Happiness, Right Understanding and Right Feelings” at the level of Individuals, “Fulfilling Relationships and Prosperity” at the level of Family, “Fearlessness” at the level of Society, and Co-Existence with rest of the nature. We also saw what is happening in the current world and how that is quite contrary to what we naturally desire. What should be the Content of education? What should be the Process of education? Content of education should be same as the content of knowledge a human being naturally desires. So what a human being needs as a content of knowledge? A human being wants to understand all the laws and details, at all the levels of his living. Next question which comes here is at what all levels a human being lives? Within Relationships. In a family. In a Society and with various Social Systems. With rest of the Nature and Existence. A human being lives at these four levels. A human being wants to understand all the laws and details at these four levels. Hence, the content of knowledge thus turns out to be following. What is the purpose of my life? And How do I fulfill it? What are the basic feelings involves in relationships? And how do I ensure them within myself and for others? What should be the purpose of society? What are the various social systems required in the society? What should be the purpose of all those systems? And many more questions. Knowledge of four orders in nature and their interconnectedness. Knowledge of Rest of the Existence. Next question is about process of knowledge. Following section highlights some salient features which should be incorporated in process of imparting knowledge. Process of imparting education should be such that it facilitates the understanding of the content of education to a human being in a way that it is easy for the person to understand. It becomes necessary to understand at this how a human being can understand better. Following are some features of process of education which when are incorporated in education help facilitate the understanding in students, in a better way. Learning by Experimentation and Doing. Going from Meaning to Word. Connecting with reality and environment around. Going from Known to Unknown. Starting the content of teaching from what students know and then taking them towards the concept which they do not know. Considering the Receptivity (Patrata) of the student. Making a distinction between Value and Skill. Understanding should be given more priority over theories and authors. Making a distinction between Experimental and Experiential education and incorporating associated process. Localization of Education. It means education should be in alignment with local conditions, local belief systems, local needs, local economy etc. When this is not the case then students begin to assume something else “non-local” as more superior than theirs. This affects local life, local relations, local communications, local systems. Trust between Teacher and Student. Trust is must essential especially in experiential education. Inquisitiveness to learn in both Teacher and the Student. Education should not be the means to achieve some other end. It should be an end in itself.